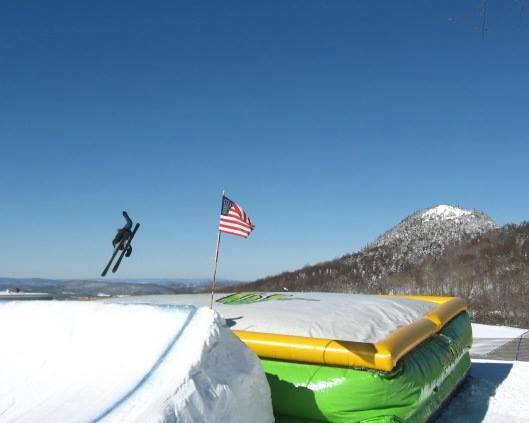 Freestyle daredevils can test their skills on the Bag Jump at Cannon Mtn, Feb. 14-17. LINCOLN, NH –New Hampshire ski areas, enjoying record amounts of snowfall, offer scores of events and deals, particularly in the upcoming February vacation weeks, and some of the best conditions ever. Family Fun Weeks at Bretton Woods that include ice skating, tubing, movies, storytelling & songs, snowman building, s’mores parties and more. Snowshoe & S’mores at Loon Mountain, an après-ski adventure involving a lift ride mid-mountain, guided snowshoe hike to the rustic Camp III lodge, and a feast of hors d’oeuvres, hot cocoa, and s’mores around a crackling fire. Saturday Night Pay-One-Price (POP) Program at Pats Peak, in which guests have access to skiing, snowboarding, snowtubing, lesson tips, rentals, bonfires, and entertainment from 3pm to 10pm. Winter Carnival at King Pine Ski Area, featuring sleigh rides, snowshoe tours, Silly Slalom, Belly Bag Races, Family Challenge Races, Gold Rush, Kids Fun Race, and more. Cranapalooza après-ski activities at Cranmore Mountain Resort, including entertainment, s’mores, face painting, Cranmore’s mascot C-More, and fireworks. Freestyle events at Cannon Mountain including the return of the Bag Jump and the second event of the Bern Freeride Series. Details on these and many more events and activities – including Valentine’s Day specials and events – can be found at www.SkiNH.com. Guests can also find information about tickets and deals, weather and conditions, resort activities, lodging and lessons. Ski NH is the statewide association representing 33 alpine and cross country resorts in New Hampshire. For more information on ski areas, vacation planning, and updated winter events at Ski NH resorts, call Ski NH at (800) 88-SKI-NH (800-887-5464) or visit the Ski NH website at http://www.SkiNH.com. Searching for gifts geared towards skiers and snowboarders? Ski NH’s Anywhere, Anytime Lift Ticket Packages offer one of the best gift ideas, especially for those that ski primarily on weekends and during holiday periods. The tickets offer savings of up to $26 off weekend & holiday rates at Ski NH member ski areas. The packages consist of the purchaser’s choice of fully-transferable lift tickets that are valid every day of the 2013-14 ski season. New for this season purchasers have the convenient option of printing their tickets at home or work, ideal for last-minute shopping. Customers can choose their favorite ski areas or customize a mix of lift tickets to two or more ski areas; tickets are broken down into five price categories of $22, $32, $47, $60 and $70 per ticket. Packages begin at a minimum of six lift tickets and can be purchased in any increment above that. 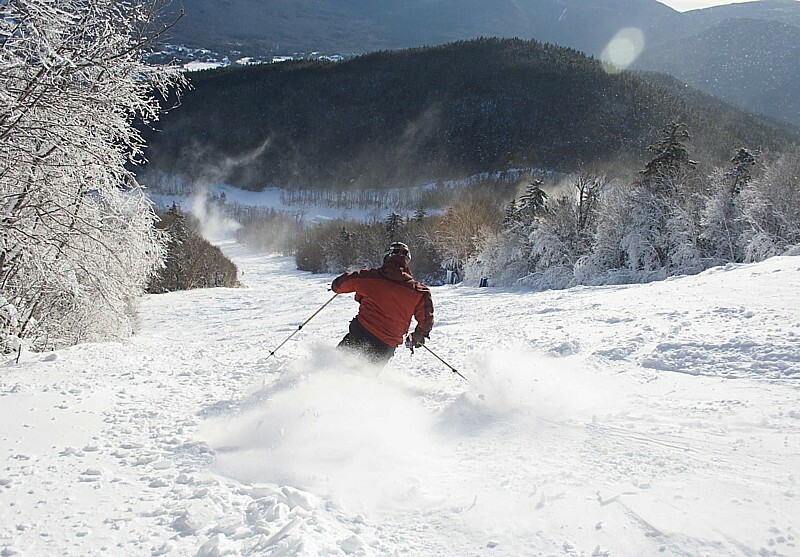 Ski areas included in the offer are Loon Mountain, Bretton Woods (sold out), Cannon Mountain (sold out), Waterville Valley, Mount Sunapee, Gunstock Mountain Resort, Cranmore Mountain, Pats Peak, Ragged Mountain, Black Mountain, King Pine Ski Area, Dartmouth Skiway, Granite Gorge, and McIntyre Ski Area. Ticket inventory is limited and many areas sell out quickly. Currently less than 100 tickets remain for four ski areas. The 4th and 5th Grade Snowsports Passport program is available to any 4th or 5th grade student, regardless of location. The passport costs $35, with a portion donated to the Make-a-Wish Foundation of New Hampshire. The passport consists of one, two, or three lift tickets or trail passes for each of the 33 member resorts of Ski NH, as well as savings on downhill lift tickets and cross country trail passes for parents and siblings, rental packages, lessons and more. To purchase a Ski NH Snowsports Passport, simply complete an application available on SkiNH.com and forward a copy of the child’s report card. Quantities are limited with only 4,000 Snowsports Passports available for the 2013-14 ski season, so it’s best to act sooner than later. Lift ticket packages and the Snowsports Passport can both be purchased online at SkiNH.com, or by phone (phone orders are subject to a $10 shipping plus processing fee). For more details and to order, visit www.SkiNH.com or call 800-88-SKI-NH (800-887-5464). Ski NH introduces a new lift ticket package just in time for holiday shopping. Holiday 4-Packs are available only until December 20 and offer a savings of $10-$26 off weekend/holiday lift tickets. Tickets are fully-transferable, making them an excellent gift idea for family, friends or even the gift giver! The Holiday 4-Pack consists of four or more fully-transferable lift tickets which are valid any day during the 2012-13 ski season, including holidays and weekends. Tickets must be selected to at least two different ski areas, with no more than 50% of the tickets from one ski area and are broken down into five price categories of $20, $30, $45, $58 and $68 per ticket. Since there are limited ticket quantities available, skiers and riders should make their purchase sooner than later to be sure to get their favorite ski areas. For details on Ski NH’s 4-Pack Lift Ticket Packages and to order, visit http://www.SkiNH.com or call 800-88-SKI-NH (800-887-5464). Ski NH is the statewide association representing 33 alpine and cross country resorts and more than 200 lodging and guest service properties in New Hampshire. For more information on ski areas, lodging packages, and updated winter events at Ski NH resorts, call Ski NH at (800) 88-SKI-NH (800-887-5464) or visit the Ski NH website at http://www.SkiNH.com. Snowboarding at Waterville Valley Ski NH has announced a season-long photo contest. Visitors to Ski NH's websites are invited to submit entries to any of six categories including downhill skiing and riding, cross country skiing, terrain parks, scenery, off the slopes and Learn to Ski and Snowboard Month. Submissions can be made though April 30, 2012 © 2011 Karen Rubin/news-photos-features.com. Ski NH has announced a season-long photo contest. Visitors to Ski NH’s websites are invited to submit entries to any of six categories including downhill skiing and riding, cross country skiing, terrain parks, scenery, off the slopes and Learn to Ski and Snowboard Month. Photos must be taken in New Hampshire during the 2011/12 ski season; the contest ends on April 30, 2012. Entrants simply visit SkiNH.com or XCSkiNH.com to enter up to five entries for the 2011/12 ski season. Guests to the site can also browse a gallery of other entries. At the end of the season a panel will select the winners in each category, along with a Grand Prize Winner who will receive a 2012/13 Ski NH VIP Season Pass valid at all member ski areas! Other prizes include Elan Skis, gear from The North Face, Bern Helmets, Dalbello Boots, Swix Wax and more. “With most skiers and riders carrying nice cameras, plus the beautiful setting we have at our ski areas, we felt this contest would be a fun way for them to share their experiences with others who have the same passion for skiing and riding in New Hampshire,” stated Karl Stone, Ski NH’s Marketing Director. For complete details, rules and to enter the contest or just browse photos, visit SkiNH.com or XCSkiNH.com. During the month of January, Ski NH and its 38 member resorts will participate in a national program to introduce guests to the sports of skiing and snowboarding. Learn to Ski & Snowboard Month is a program taking place across the United States that features special offers making it easy and affordable for people to learn to ski, snowboard, cross country ski or snowshoe, and for current skiers & snowboarders to enhance their skills by taking lessons from professional instructors. Among the special offers being featured in New Hampshire is Learn to Ski & Snowboard Free Week from January 7-13. 2012. During this week, 19 NH ski areas will be offering a limited number of free learn to ski or snowboard packages. These packages include a free beginner lesson, free equipment rentals, and a free beginner lift ticket or trail pass to those who register in advance. Participants must visit http://www.SkiNH.com to register and download a Learn to Ski or Ride Free Coupon; they then contact one of the 19 participating areas to make a reservation for a specific day that week. Registration opens in mid-December. 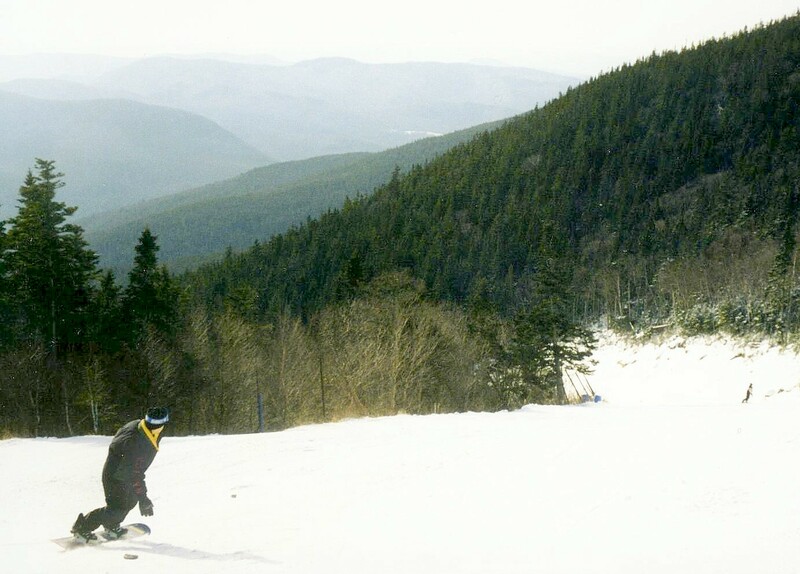 Participating alpine areas include Loon Mountain, Bretton Woods, Cannon Mountain, Waterville Valley, Attitash Mountain Resort, Wildcat Mountain, Cranmore, Gunstock Mountain Resort, Pats Peak, Ragged Mountain, King Pine at Purity Spring Resort, Black Mountain and Granite Gorge; participating cross country areas include Jackson XC, Great Glen Trails, Bretton Woods XC, Waterville Valley XC, Purity Spring Resort XC & Snowshoe Reserve, and Granite Gorge XC. Every day of the ski season, New Hampshire’s ski areas already offer specially-designed learn to ski and ride programs to introduce new people to the sport. In addition to these learn to ski and ride packages, there will be many other special programs offered during January that normally are not available. Among these offerings, guests will find free & discounted lift tickets for those who bring a friend to try the sport, special pricing on learn to ski or ride packages, and follow-up rewards for first timers who choose to hit the slopes or trails again. Guests can visit the January Learn to Ski & Snowboard Month section on SkiNH.com for full details & offers. To learn more about Ski NH’s January Learn to Ski & Snowboard Month events and New Hampshire’s 38 downhill and cross country resorts, visit www.SkiNH.com. Ski NH is the statewide association representing 38 alpine and cross country resorts and more than 200 lodging and guest service properties in New Hampshire. For more information on ski areas, lodging packages, and updated winter events at Ski NH resorts, call Ski NH at (800) 88-SKI-NH (800-887-5464) or visit the Ski NH website at www.SkiNH.com.